It’s #TransformationTuesday everyone! 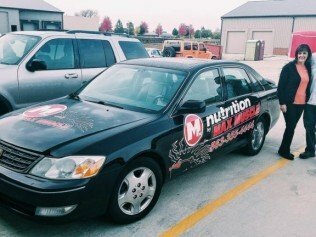 Today we highlight Scott and Karen Herkes, the owners of Max Muscle Sports Nutrition in Moline, Illinois. With the company rebranding and their old vinyl peeling, it was time to transform their Toyota! Our lead designer, Jane Huber, rebranded their graphics and gave their vehicle a new look that hit the streets of the Quad Cities yesterday! Max Muscle is staffed with certified nutritionist and is a leader in sports nutrition. With these new graphics, the Herkes can easily display who they are, what they do, and how they can be reached. As we have stated before, graphics such as the ones Scott and Karen have placed on their car are the perfect way to reach your customers. With the lowest cost per impression, vehicle graphics and wraps are your chance to showcase your company to hundreds of people each day. All you have to do is drive your truck, smart car, trailer, van, scooter, skateboard…or however you kids get around these days. You’re already going places, why not make a way for people to recognize you along the way? Increase your brand awareness by adding some creative detail to your vehicle today and get more business tomorrow! Give us a call at 563 424 5841 to get started on your graphics. You can also visit our Facebook page here, or see past projects by visiting our virtual showroom. Let’s transform your vehicle and increase your brand awareness!